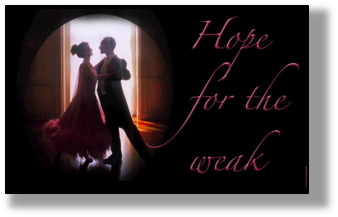 Well, tonight's message is entitled "Hope for the Weak". It was given to me about two months ago, and the whole idea of the message is to encourage all of you to seek intimacy with the Lord. In spite of your faults, don't be afraid - don't be afraid of getting close to Him, because He wants to help you. The devil is trying to keep you from getting close to Him by running in the other direction and flooding your mind with guilt and condemnation. But the Lord is standing there with all the medicine and all of the remedies that you need to overcome yourself. And He wants you to come to Him right away. So, I am going to share, very transparently, how silly I am - and maybe that will give you some hope. "Even the butterfly, as fickle as she is, will always go to the sweetest source of nectar." (That was the Lord speaking). Then I said to Him, "Oh, Lord, I was so enjoying looking into Your eyes. It was very hard to stop looking and to stop listening. You are so exquisite. "So are you, my Bride." Tonight, He had me dressed in pink; a beautiful gown, very pink, not pale but vibrant. As we were dancing, by the third song, I asked Him, "Lord, why am I wearing this intense shade of pink?" And as an aside, He often does this when we get together in prayer - we're almost always dancing, some kind of very simple ballroom dancing, close dancing. And the color and the look of whatever He's got me dressed in has a great deal to do with the message. It's all very consistent. So, I said, "Lord why am I wearing this intense shade of pink?" He answered, "I thought you'd never ask. It's azalea pink and it's because you're blooming. I'm so proud of you, Clare, so proud."" "But, Lord, You are the one responsible for me blooming, not I." "Yes, but you did correspond. You don't know what a load you took off My mind. Now you're in the place I prepared for you. Your name is even correct. So much is going well, and yes, I have you heavily protected. But you had to overcome certain foibles, such as what you did tonight after My very personal invitation to you." "Yes, I was bad, Lord. I was very bad." "Well, at least you recognized it and repented. That was so important. Please tell them what you did." Okay . . . well, I was lying down for my nap and I saw You and we rested together for quite some time. I started feeling better and You said, "It's time to get up now that you feel better. Come, let's pray together." As is so commonplace in my past, I got drawn off course. Irritated that I was locked out of my website account, I took time to call them. Then I began boiling water for noodles for dinner. I put You off. I delayed my coming to You when You were waiting for me so patiently and gave such a sweet and clear invitation. Then, because I was waiting for a call back from the web people, I decided not to go into prayer right away, but to check my email so I wouldn't be interrupted at a crucial moment in prayer. Well, as I was replying to an email, the phone rang. I went to get up and tripped over a wire that brought the microphone and other equipment down on top of me. I hurt my knee and wrists landing on the hard tiles. And I knew immediately I had stepped out from under Your protection by my self-will and disobedience. And the enemy, through my own fault, had gained entrance. The Lord answered, "Well said." Oh, Lord, I am so sorry. You are so tender, loving and patient with me and I presume so foolishly. Because of the graces You've given me and continue to shower on me, I see myself as worse than the worse murderer on death row. "That's accurate," He answered. "But what I want everyone to know, is that no matter how pitiful and foolish, no matter what they've done in the past, no matter how flimsy and self-willed they are, I can fix and use them. If there's hope for you, My love, My wretched Bride - there's hope for anyone. I say that in all tenderness and sincerity. You are not capable of seeing how bad you truly are, because I have hidden that from you, lest you fall into despair. So, what you say sincerely but in projected humility is actually very, very true. Do you know how many souls would give everything to have just one moment with Me as you have every night? "Let me put it to you another way . . . you have been sent as an ambassador to a faraway country. Unfortunately, your salary is fixed and very small. You've worked hard and the King of your country sees your many frustrations with the tiny funds you operate on. You have done much with so little, but you have big dreams and so much more to do. So, the King sends His messengers to tell you He's coming, so be at the dock at such and such a time. You come to the designated pier and see the ship coming into harbor. It's carrying the King and His men, and laden with gold. It has come from the other side of the world just for you, to implement certain dreams. It contains billions of dollars and a whole crew of people to serve you. And as it is approaching you see the King standing on the bow, so very eager to see you. So eager to hear your response to this immense gift, and His very own presence. "But you get a notion in your head, 'You know, I'm really not dressed for this. I'll run down to a thrift shop and pick up some new clothes.' Really, your clothing is quite adequate, you just got impatient and restless. On the way you stop at Starbucks to get your Frappuccino. "In the meantime, the ship has landed, the ramp is in place, and the King with His escorts of mighty men of valor and a whole crew of people prepared to serve you begin to descend from the ship down the ramp. But you are nowhere to be found. The King inquires, "Where is she?" and an attendant shamefully bows his head and says, "She went shopping." "That's a mild picture of what I must endure from you. Do you think that is fair or right, My love?" No, Lord, that's horrible. You should give Your gifts to another, more grateful and worthy. I'm not fit for them, not fit at all. "Exactly My feeling. But rather than depart from you, My love keeps drawing you back and back and back. Because I know how frail you are. And I don't want to hurt you - but what a bad example you are! "I clarify this for everyone, because I want them to know how patient and loving I am. And that their sins are nothing to Me, once they've repented. Their sins will not stop Me from calling, equipping and bringing them into their God-given destiny. I want them to know, that Yes - I will allow the enemy to sift them because they rejected My covering by their disobedience. But I'm still waiting to have them back in My arms and give them another chance." I replied, "Lord, I don't know what to say. 'I'm sorry feels totally lame'. But I can see I need to change and I'm counting on Your help. I know You will not desert me in my weaknesses." Thank You, Jesus! Thank you, My Love, My life and My only reason for being. Forgive me Lord, I'm just a frail human vessel, and far from good stock at that. "My love, as long as you are willing to work with Me and not forsake Me, I will stand by your side until you get it right. I adore you, Clare and I have much to thank you and rejoice over you for. Even though you know in part how unworthy you still are, I am thankful that you meet Me halfway, that you persevere. Now don't let this message give you license to be foolish again. The devils are waiting to spring another trap on you. Persevere and go back to your music. Yes, after you've done the dishes." And that was the end of the message. It's really quite amazing how intimate God is with us. He knows I had to do the dishes, that's part of my daily duty. I keep order in the house. And He's not too lofty or high in Heaven to mention "Go back and do the dishes." He's just amazing, He's so amazing, so approachable. I think part of my mission in this life is to share with the Bride how really approachable He is and that He is right down here on our level. He doesn't miss a beat of what's going on in our lives. Well, the Lord bless you all and I hope the weakest of you has gotten some hope from this little story.